Level the playing field with the Moondog Industries™ AIRSOFT 101. You may be a noob but that doesn’t mean you have to look like one. 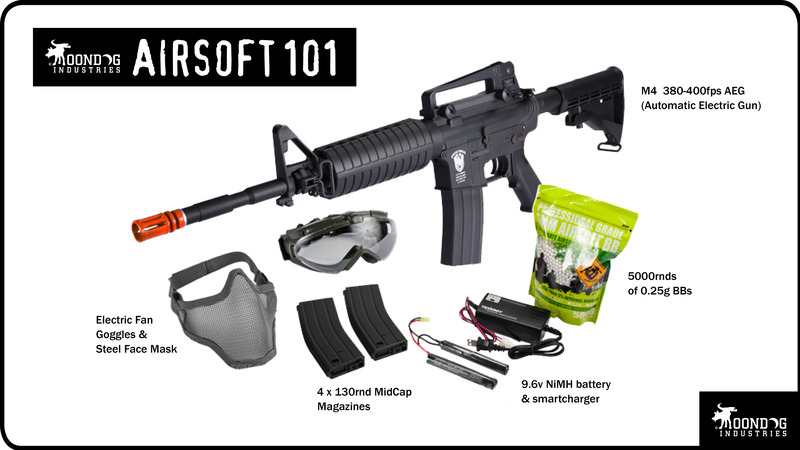 With the Moondog Industries™ AIRSOFT 101 Starter Kit you’ll have gear that’s as good as any other player on the field. Package Includes: AIM/Top custom 8mm gearbox M4 Airsoft AEG (automatic electric airsoft gun), 4 spare 130rd M4 magazines (MidCaps), 5000 rounds of Evike.com 0.25g BB’s, Smart Charger, a 9.6V 1600mah NiMh Matrix battery pack, a Matrix steel mesh mask and electric fan safety goggles. You’ll get everything you need to start playing airsoft outdoors except for your camo, hat and boots. Oh and underwear. Inner Barrel: 363mm / 6.04mm tight bore. Gearbox: 8mm Full Customizable Matrix Ver.2 AEG Gearbox.